TIANJIN, China -- The son of a former police chief is one of two silent owners of the warehouse in Tianjin where explosions killed at least 114 people, and used his connections to help obtain licenses despite the hazmat facility violating safety rules, Chinese state media reported Wednesday. The other owner is a former executive at a state-owned chemical company who also used his connections to smooth the way for approval for the facility, the official Xinhua News Agency said in a lengthy report on the warehouse company Ruihai International Logistics. The report supports the common perception that well-connected private Chinese companies use personal relationships with people in the government to override rules, sometimes with disastrous consequences. It also shed light on the murky ownership structure at Ruihai, which had been the source of rampant rumors of potential high-level connections and cover-up since the Aug. 12 blasts, which also have left 65 missing and 674 in hospital. 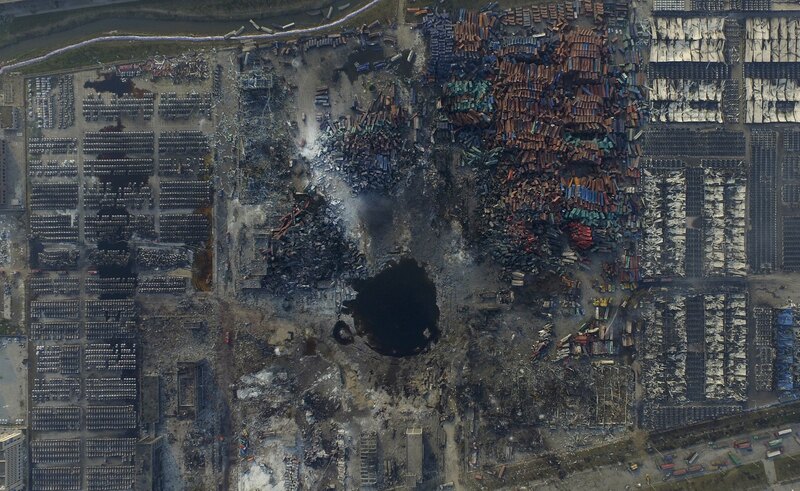 The two men, identified as former Sinochem executive Yu Xuewei and the late Tianjin port police chief's son, Dong Shexuan, are among 10 Ruihai company officials who have been detained in the investigation into the blast. Dong said that Yu enlisted him into the company in 2012 because of his connections and that he was easily able to obtain a fire certificate for the hazmat business. "I brought all the materials for the renovation plans, and the fire certificate was soon issued," Dong was quoted as saying. The fire certificate apparently allowed local planning officials to issue a building permit, even though the hazmat warehouse would be less than the required 1,000 yards away from homes and public roads, a clear violation of state safety rules. "We took into account that the fire certificate as issued by the fire division," Zhu Liming, a planning official told Xinhua. Dong said Ruhai also had to clear another seemingly impossible obstacle. A safety evaluation firm had told Ruihai that a satisfactory report was out of question because of the warehouse's proximity to residential homes. "But Yu Xuewei asked me not to worry, but leave it to him. So he changed the safety evaluation firm and got the report," Dong told Xinhua. Both Yu and Dong chose to be shadow owners. Yu asked his wife's cousin to hold his 55 percent share in Ruihai on his behalf, and Dong had a high school classmate claim his 45 percent share. It was not immediately clear why Yu wanted to camouflage his involvement, but Dong told Xinhua he did not want his father implicated in the business. "The public perception may not be good, given my father's position with the police," Dong told Xinhua.